This 9" x 12" Artagain pad features acid-free, medium-weight desert rose colored sheets with a light texture that is ideally suited for soft pastels and charcoal. Each tape-bound pad contains 24 sheets of 60 lb. cover stock that contains over 50% recycled materials. 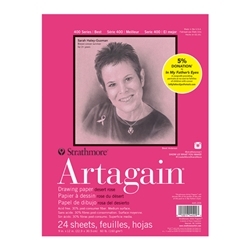 With every purchase of this Artagain Pink Pad, a five cent donation will be made to In My Father's Eyes, a nonprofit providing portraits at no cost to families of children with cancer.